The latest reports from OREB on the Ottawa Real Estate market show that in many areas the market is showing no signs of a significant summer slowdown. The condo market continues to gain momentum as is the”lifestyle” market which includes homes over the $750,000 price range. Average prices are up in most neighbourhoods across the city, with central and central-west neighbourhoods seeing a bigger jump in average sale price as compared to Ottawa east. Savvy buyers are noticing that even though Ottawa is trending towards a seller’s market in many neighbourhoods it’s still a good time to get into the market, particularly with prices on the rise. With stories of price increases in Vancouver and Toronto in the recent years they may be very smart to do so. While statistics are useful in establishing trends they don’t necessarily reflect specific properties or neighbourhood trends. If you have questions about buying or selling, we always love to chat about real estate, please email us at info@teamrealty.ca or contact a member of our sales team. OTTAWA, Aug 3, 2017 – Members of the Ottawa Real Estate Board sold 1,530 residential properties in July through the Board’s Multiple Listing Service® System, compared with 1,490 in July 2016, an increase of 2.7 per cent. The five-year average for July sales is 1,446. The average sale price of a residential class property sold in July in the Ottawa area was $420,335, an increase of 5.3 per cent over July 2016. The average sale price for a condominium-class property was $267,641, an increase of 2.8 per cent over July 2016. The Board cautions that the average sale price can be useful in establishing trends over time but should not be used as an indicator that specific properties have increased or decreased in value. The calculation of the average sale price is based on the total dollar volume of all properties sold. Price and conditions will vary from neighbourhood to neighbourhood. 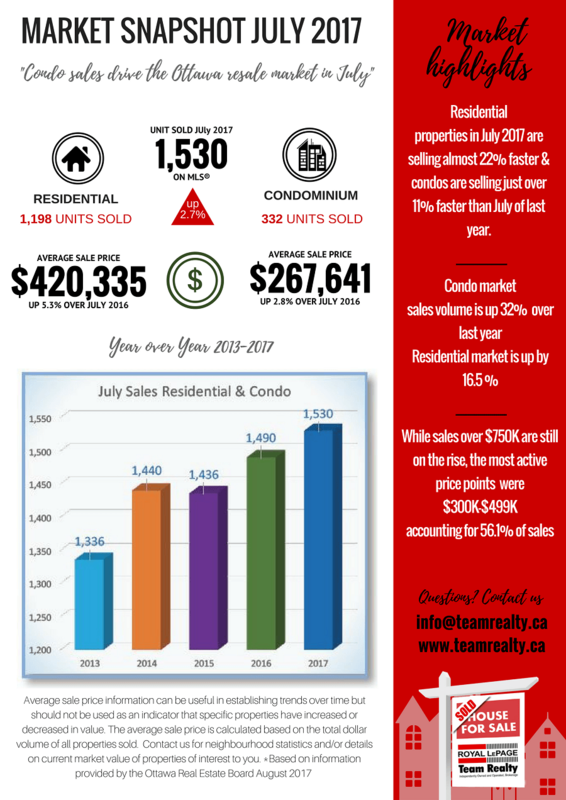 The post Ottawa Real Estate Market Snapshot July 2017 appeared first on Team Realty.